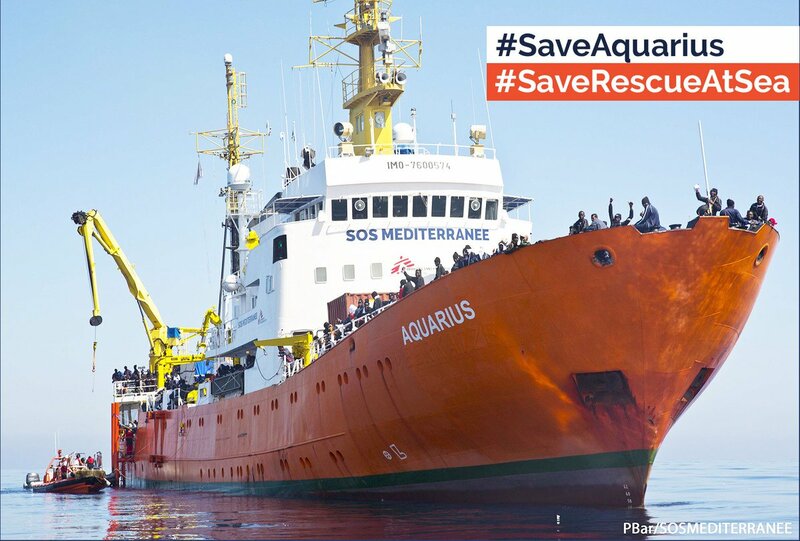 Keep the civilian rescue ship, the Aquarius, at sea on the Mediterranean Sea! As authoritarian leadership governs our world, democracies become less and less inclusive. Consider the treatment of people who have to migrate from situations of violence. There are growing reasons to migrate, with climate change and climate change violence affecting the south enormously. Affluent people are not called migrants, but rather expatriates. Since the most affluent are also the most influential, they shape the discourse of crisis prominent in the linked domains of economics and migration. “Crisis” leads the public to believe that no human being is directly concerned. The bodies of color drowning in the Mediterranean Sea are not human, are not people. They are just a crisis! In Italy, a close election brought to power a coalition of right wing and extreme-right wing leaders described as populist. They used the fear factor associated with “crisis” to eliminate the reality of the political situation in Italy. Italy’s parliamentary regime makes it hard to have a leader when elections are tight. After the so-called populist Giuseppe Conte became the head of the government, he nominated the leader of the extreme right-wing group “the League,” Matteo Salvini as Minister of the Interior. As good populists, they abhor the arrival on the coasts of Italy of what they call the migrants, especially those of color; their campaign was mainly based on fear of foreigners of color. Meanwhile, it is precisely people of color who are roughly exploited in Italian industries that count on these populations without rights to extract heavier profits. When Matteo Salvini stated that Italy will not receive migrants anymore, he used the word “migrants” to signify the Other, a large category of human beings mostly non-Caucasian. Recently in Europe the odyssey of the only civilian rescue ship of the Mediterranean has epitomized this reality. They would cruise the Libyan waters. The Aquarius is a humanitarian ship chartered by SOS MEDITERRANEEwith the collaboration of Medecins sans Frontieres, Doctors without Borders. The story of this maritime rescue team is emblematic as this ONG was formed after Mare Nostrum was dismantled. The last blow for the Aquarius came from the Italian government, which pressured the Panama Maritime Authority to deflag the Aquarius. Not having a flag makes it impossible to dock although the ship can stay at sea. That occurred while another show of force took place when the Aquarius had another 59 people who had been rescued off the coast of Libya. One of the sailors on board of the Aquarius spoke with a journalist. What are you able to tell them? “To tell them? They tell us thank you and I ask them to forgive us, I feel ashamed. When we arrive at a rescue site, there are no numbers, no migrants. We see children in the arms of their parents who are drowning. We see people covered with oil. We hear screams. We see people who have been adrift for days, without food, without toilets, with oil leaking everywhere. We see gazes fixing us. We have outreached hands. We see all that. And then what to tell them? I don’t know. Sorry it’s shameful, it doesn’t reflect our values, this is not what Europe is about, sailors don’t abandon people at sea. “We can see Malta, and it has been 5 days. Where they come from, they have survived atrocities. They faced inevitable death until our rescue boat arrived. Now we have them on the deck, they are still thankful and trustful. Therefore, sorry, sorry for the people who make decisions, they don’t respect you. They call you migrants, who am I to call you migrants? Here onboard people are simply human beings with names, there are no migrants here. These people, these policy makers, they must come onboard. We will provide them with boots and sailor gear and they will see. “We have children who are running around on the deck, they are full of life and playful with us. So just our apologies that you are not welcome. The European Union faces its own contradictions. With the rise of the extreme right wing, the Aquarius has become that annoying ship that must remain moored in Marseille. After the end of Mare Nostrum, the goal for some in Europe has been to bring the civilian rescue intervention of SOS Mediterranée to an end. In 2017 the Aquarius rescued 15 078 people from 40 countries, 34% more than in 2016. 14 % of the survivors were women. On October 7th, across Europe, from Berlin to Madrid, thousands of people demonstrated in support of SOS Mediterranée. Petitions are circulating to demand France provide a maritime registration to the Aquarius and to allow the ship to return at sea. 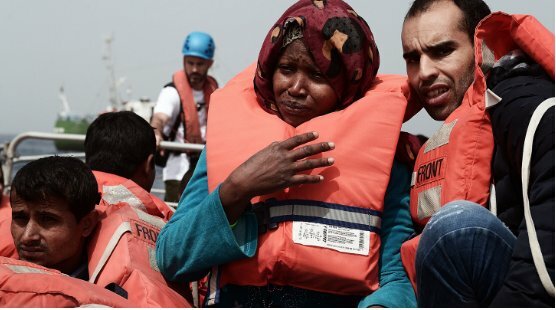 Nobody is questioning anymore the Libyan torture camps and yet, if the Aquarius doesn’t return to the area, the Libyan Coast Guard will be left in charge of “rescuing” the people escaping the violent grip of the system of migration. Please consider signing the petition, here.